Whole Foods has a wide array of organic and locally sourced merchandise, but go beyond the produce section to find a lasting gift. While GWorld allows students to brag about how they can dine at popular restaurants rather than a typical dining hall, it poses a dilemma for holiday gift giving. If you don’t want to barrage your loved ones with gift cards bought at the last minute on GWorld, finish off your semester GWorld budget with proper presents or some gag gifts for your roommates, friends and family. Located in the basement of Shenkman Hall, Gallery Market is a one-stop-shop for every college student’s needs. This season, students could buy snack-sized packs of Goldfish or a mini-box of Cheerio’s or a pint of Ben and Jerry’s “Half Baked” to fill a roommate’s stocking. But rather than perishables, treat your friends to a sense of professionalism seldom seen in a dorm. Gallery Market’s dry cleaning is more affordable than the nearby Esteem Cleaners and one trip to the cleaners’ will spruce up any closet. For less than $5, you can give your roommate the gift of a wrinkle-free shirt for their next job interview. Your friend might razz you when you reveal you spent your last dining dollars for their gift, but they’ll thank you later. CVS may not seem like the perfect place to buy gifts, but if you know which aisles to shop, you can find a gift they’ll use or something to make them laugh. If you know your friends’ tastes, assemble a gift basket full of their favorite candy, makeup or snacks for as much or as little you’re willing to spend. Showing you’ve paid attention to the small things they rave about or what fills their closet and cabinets will show them you at least put thought into this somewhat-last-minute gift. CVS also stocks plenty of merchandise that would make your newly minted D.C.-local friend laugh, like panda shot glasses ($3.49) that look like knock off zoo souvenirs or a tie dye sweatshirt emblazoned with D.C. across the chest ($16.95). But the merchandise serves a dual purpose because your family might swoon opening a White House keychain ($7.95) while telling them about how close your new dorm is to 1600 Pennsylvania Ave. Just be sure not to show them the receipt. 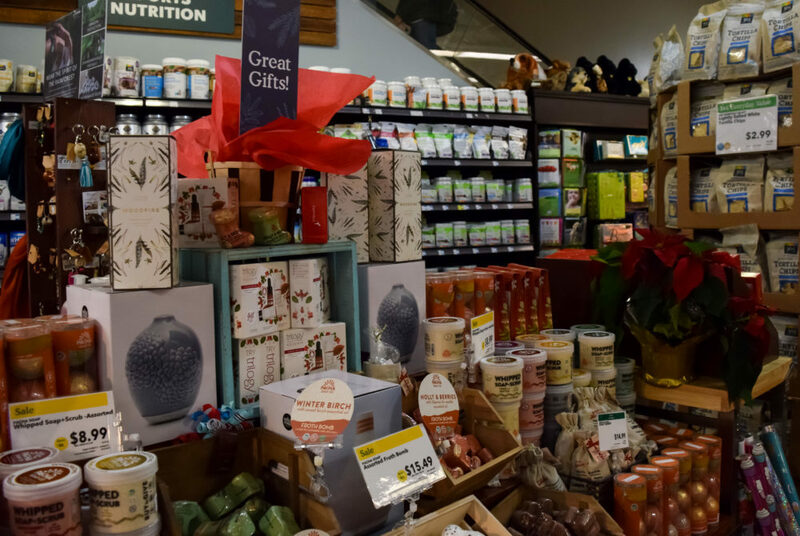 Whole Foods has a wide array of organic, sustainable and locally-sourced merchandise, but go beyond the produce section to find a lasting gift. Take a trip down the escalator to the lower level’s cosmetic section to find various high-quality lipsticks, eyeliners and skin products from brands like Burt’s Bees and EO Products that make for quality gifts. Most have a lower price tag than you’d find at Sephora. Some shoppers might be confused when they run into a selection of shirts while looking for a snack, but experienced shoppers may have set out for the store’s Threads for Thought section. The brand is an eco-friendly nonprofit that offers t-shirts for about $40, scarves for about $25 and other accessories. The goods are sold at stores around the country, like Nordstrom and Saks Fifth Avenue, but luckily they’re also sold right on campus.